How’s the weather in your neck of the words? While we’ve had snow, my students definitely don’t know much about Ice Carving. This week I pulled out the ipad and showed them this YouTube video about Ice Carving. ((I did stop the video right before the end because, Martha Stewart who narrates the movie, mentions cocktails at the party.)) They were HOOKED! I’m also really excited to tell you about a new partnership! 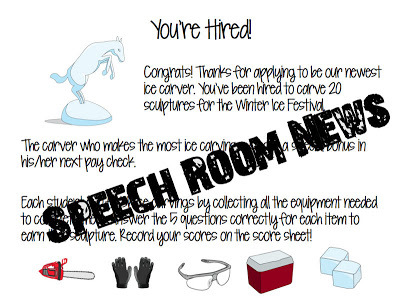 Speech Room News products will now often include Smarty Symbols, by Smarty Ears. What does that mean for you? Better pictures. Clearer products. Higher quality purchases. Smarty Symbols is a library of over 13,000 symbols. It’s available for app developers to use in their apps. I’m really excited that Barbara is letting me use them in my products. Check out the images below and stay tuned for another new item tomorrow! You will mostly see them in articulation activities, but today’s entire activity comes from their symbol sets! 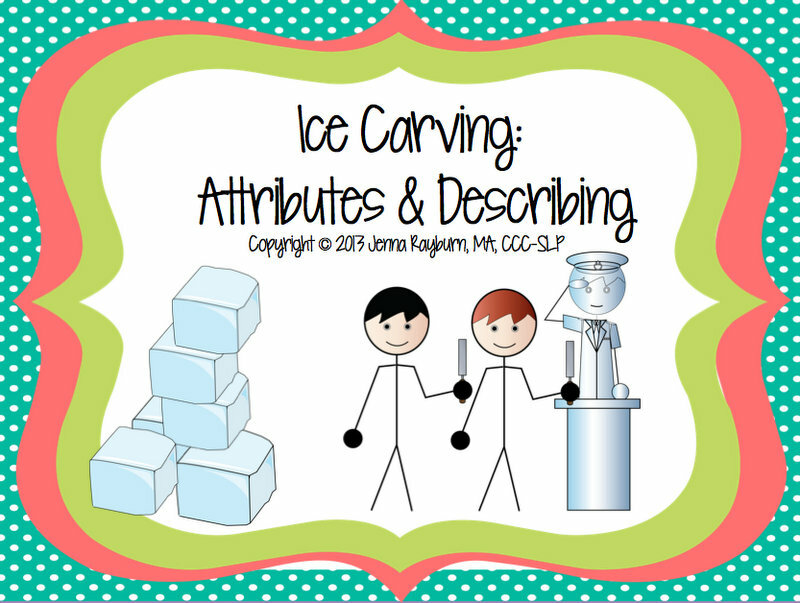 Ice Carving: Describing Attributes features 42 pages of activities to boost your students receptive and expressive language activities. Start with this “You’re Hired” letter explaining how your students have been hired to help with the annual Winter Ice Festival! They need to do receptive/expressive describing tasks to earn sculptures. Introduce the describing skills using the poster. 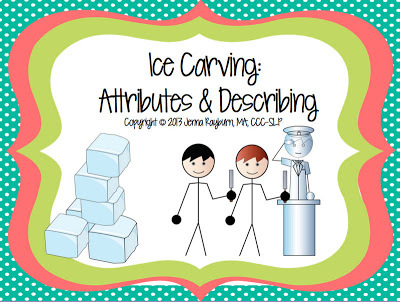 Student will need to gather all the materials in order to carve an ice sculpture. This includes: gloves, ice chest, ice blocks, protective glasses, and carving tools. For the Receptive Describing portion of the activity, students need to match the descriptions to the given item. Once they match all 5 descriptions, they earn a sculpture! 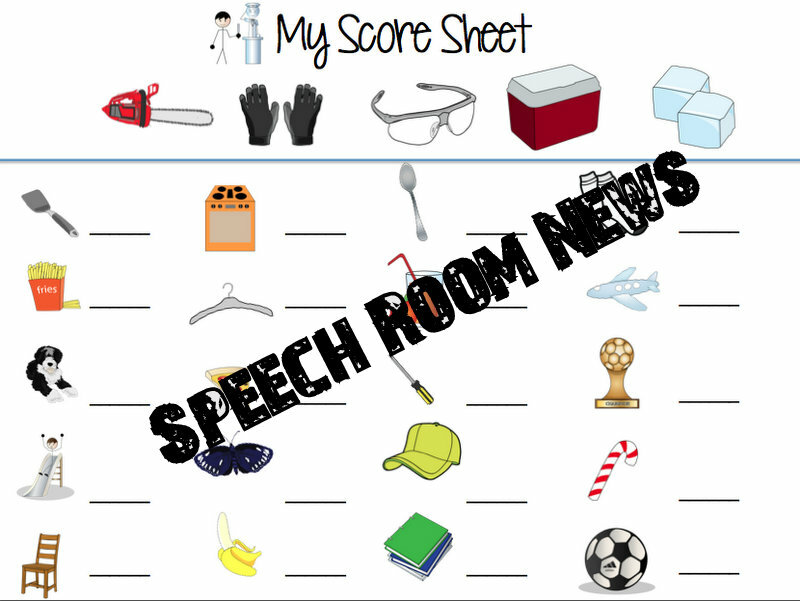 For the Expressive Describing activity, students are shown one item. They need to describe that item in 5 different ways, using the cues on the card. Student record the amount of descriptions they made for each item on this score sheet. 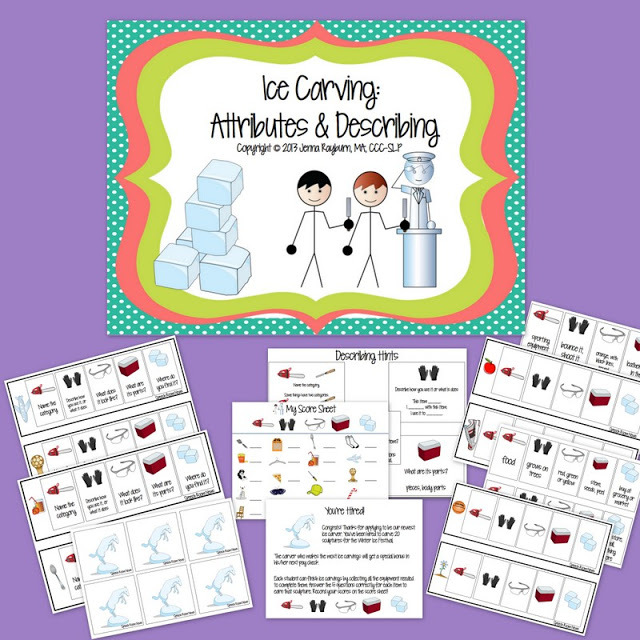 You can grab this activity in my TPT store. I hope you’ll leave feedback if you grab it! looks like another GOOD one!!! This looks fabulous! Thanks for another great activity! Never would’ve thought of ice carving! Neato!!! My students would love this! Love that you’re partnering with Smarty Ears! Looks great! Looks like a great resource to use across multiple grade levels. Always looking for interesting materials for my older crew! This looks very helpful for my intermediate school students. Thanks! Looks like a fun winter pack that is definitely a new topic for most of our kiddo’s! This looks like an awesome packet! I just got two clients with expressive and receptive goals so this would be great for them! This looks great! I like the cue card, too! How creative! And I love the symbols! Kids need so much help learning how to describe effectively. It has such an impact on their writing as well. This is a a unique topic to use to help develop descriptive skills. Thanks for your creativity. love the self monitoring score sheet. I think this would be good for upper elementary and jr high. Thanks for creating another great material! What a refreshing twist on reinforcing these concepts. Another great project! Looks like a great activity to introduce new vocab among lots of other things 🙂 Look forward to more like it! This is so cute! How you come up with your ideas is beyond me! This targets a goal that I address with quite a few clients! I am getting a free ice carving at my wedding for having a family connection with a staff member at our hall. While looking through the albums, we saw one of a dragon and joked in front of my 5 year old nephew that we would have that at the wedding. He’s apparently holding us to it, because he mentions it nonstop. He will be sorely disappointed when it’s just a big letter “F” (my new last initial). This is very well thought out Jenna! You covered receptive and expressive (yay!). I love how tackled the way some items have two categories as “big idea (food) and “more detailed” (fruit) – that is often a hard concept for my language delayed students to get. The symbols you used tie in nicely to the attribute they stand for(hands for function; googles for looks like)too! Just AWESOME! Would love to have! Great spin on this language area! This would be great for my 3rd and 4th graders! I’m working on describing and comparing/contrasting with several of my students, and they are REALLY struggling with identifying important details. Right now, we’re focusing mainly on naming the item, naming the categrory, and talking about how it’s used or where its found. They haven’t quite gotten to the point where they’re independent with that yet. I bet they would love this activity! I love the hints pages. It is so hard to cue attributes sometimes. Love this! Another great activity. I have so many students working on describing, and this will be SO useful. This looks like a great new way to teach and reinforce describing. I am also looking forward to your articulation materials using the new Smarty Symbols. The pictures look clear and simple for children to independently identify. I’m working on this with several of my elementary kids! Having another activity would be really useful! 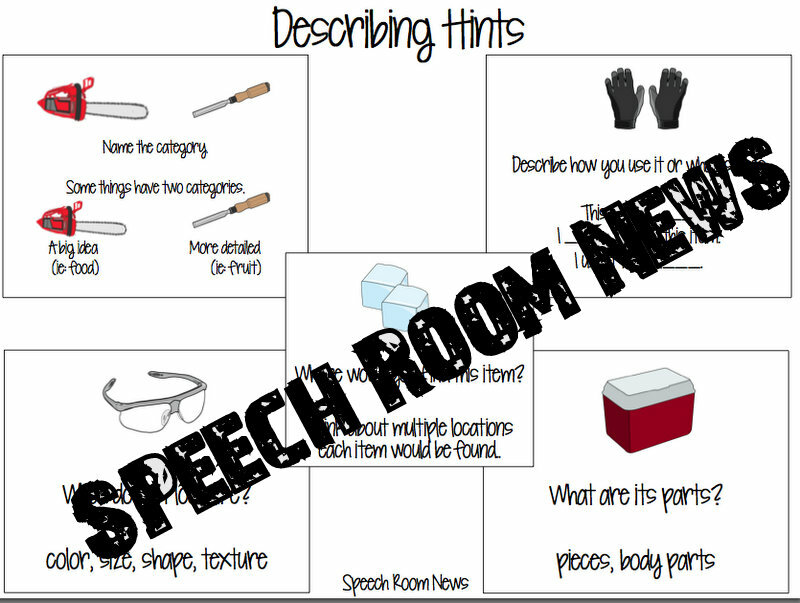 I have been looking for activities for using describing words as several of my elementary students have goals for this and have really been struggling to come up with descriptions beyond an item’s color. I love the hints page & think the score sheet would give them extra motivation as they self-monitor their descriptions. This looks great! I love the score sheet for self-monitoring and carry over skills. This activity pack looks great! Another great one by Jenna – love your creativity! This looks like an excellent packet! It looks to be appropriate to use with the Expanding Expressions Tool (EET), giving my students new terms to describe that go along with the season. I’m also working on putting together a unit that goes with the “Don’t Break the Ice” game and this looks like the missing piece for that unit. Thanks for your creativity! Very exciting to have new clipart! This looks like a fun activity! COngrats Carly! You’re my Random winner! Email speechroomnews@gmail.com and I will send you a free copy! THANKS! I love all the materials you produce and so do my students. You save me a lot of time! Looks like the perfect set of activities for Winter Carnival time here in Minnesota! Very creative! and I think students would be motivated by the idea of being an ice carver. I would love to have this packet. Thanks for creating great materials. I am a new SLP-A who lives on a budget and your materials have helped me start a great materials library without breaking the bank. Looks great! Perfect for my students…we are in North Dakota! Love this theme. Can’t wait to see the new smarty symbols pictures! Thanks for all you do! Looks great, very cute! Love that there are so many pics so it can be used with all my pre-readers! This looks great Jenna! Describing and using details is very difficult for many students on my caseload. This would be great. Looks awesome! hope to use it soon!! This looks like an awesome pack! I like the fact that they have to complete a set number of tasks before earning the reward. I am thinking I see a new theme in my future! Clever to combine with a video! Working in an inner city school, its apparent that so many of our little guys/gals lack such basic vocabulary and developing age- appropriate sentence structures with adequate descriptors and details. Such a neat activity to target these skills with a new topic to increase vocabulary even more! This looks great! I love the graphics… The topic is something we have not yet talked about this winter… thanks! I like this one! My kiddos would enjoy it a lot. Clever–and unusual!!! Looks like fun!! Looks like a great activity! Great idea! Looks fantastic! I have so many kids I could use this with! Describing skills is high on my list of importance for my students!